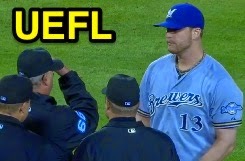 2B Umpire Jim Joyce ejected Brewers P Will Smith for an illegal substance in the bottom of the 7th inning of the Brewers-Braves game. With one out and three on, prior to the 0-1 pitch to Braves batter Todd Cunningham, Braves Manager Fredi Gonzales requested an inspection of Smith's person from HP Umpire Chris Segal. After further investigation, Joyce discovered an illegal substance on Smith's right forearm and ejected the pitcher from the game pursuant to the penalty prescribed by Rule 8.02(b), the call was irrecusable. * At the time of the ejection, the Braves were leading, 2-1. The Braves ultimately won the contest, 10-1. This is Jim Joyce (66)'s fourth ejection of 2015. Jim Joyce now has 9 points in the UEFL Standings (7 Previous + 2 MLB + 0 Irrecusable Call = 9). Crew Chief Jim Joyce now has 3 points in Crew Division (2 Previous + 1 Correct Call = 3). *Rule 8.02(b) [OBR 2015 Rule 6.02(c)(7)] states that no pitcher shall, "have on his person, or in his possession, any foreign substance. For such infraction of this section (b) the penalty shall be immediate ejection from the game." This is the 54th ejection of the 2015 MLB Regular Season. This is the 25th player ejection of 2015. Prior to ejection, Smith's line was 0.0 IP, ER. This is the Brewers' 3rd ejection of 2015, 1st in the NL Central (MIL 3; CHC, CIN 2; PIT 1; STL 0). This is Will Smith's first career MLB ejection. This is Jim Joyce's first ejection since May 19, 2015 (Larry Rothschild; QOC = Y [Balls/Strikes]). This is the first Illegal Substance (Pine Tar) ejection since April 23, 2014 (Gerry Davis/Michael Pineda).